While Slim in 6 promises to literally reshape your body in a mere six weeks, sometimes you want more dramatic results. Yes you want to exercise, tone, and sculpt, but you also want to shed pounds, to cleanse your body so that when those six weeks pass you are left feeling light, elegant, purified and beautiful. If that is your angle of approach, then you should consider the Slim in 6 Fast Results Bundle. 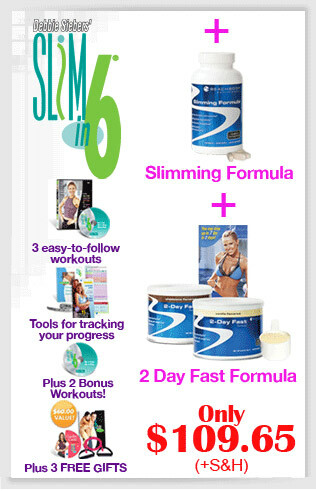 Included with the basic Slim in 6 package is our 2 Day Fast Formula to help you responsibly cleanse your body before you begin your exercise regimen, and our Slimming Formula to help burn fat by speeding up your metabolism with natural products. So what are you waiting for? Debbie Siebers will show you how to sculpt a new body while our nutritional products help you burn off the pounds--together, they form an unbeatable combination! 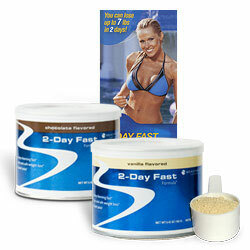 Please note: The 2 Day Fast Formula is intended for use before you start your Slim in 6 program. Fasting is a time honored practice that dates back to the Ancient Egyptians and Greeks and was developed to deal with auto-intoxication - the food that remains in your body, putrefying and releasing toxins. Since then, fasting has become a global phenomenon as people cleanse themselves through fasting, allowing their bodies to flush out impurities and stored fat, seeking that sensation of lightness, well being, and radiant health. Now, with the benefit of Beachbody's scientific research and advanced nutrition you can practice this cleansing responsibly, ensuring that you get a healthy dose of vitamins, protein and minerals by taking the 2 Day Fast Formula - and gain benefits and results that the Ancients could only have dreamed of. Our Slimming Formula is an excellent supplement that helps promotes fat loss, especially if you have decided to increase your level of daily exercise. It's different from other weight loss supplements in that it's made of only naturally potent ingredients and has a profound effect on your metabolism. 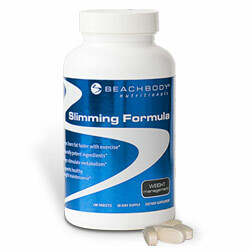 This Slimming Formula not only facilitates weight loss, but also supports healthy weight maintenance once you’ve reached your optimal or desired weight. One of the greatest benefits of the Slimming Formula for women is that in addition to helping you burn fat and speed up your metabolism, it can help promote and increase regularity and help decrease bloating. The Slimming Formula does not contain ephedrine and does not cause nausea, abdominal cramping or sleeplessness like many weight burning supplements. It does promote healthy fat loss and increased digestion.